If you're into the costume game then you know how important little details are. Now, you might be great at painting faces. You might know how to create all the classic from a Day of the Dead skull to a happy clown but if you want to take your face to the next level then you should try going three dimensional. Yeah, your witch makeup is classic. You've got the green face paint, a believable and well-placed wort on your nose. Now all you have to do is make it unforgettable with long hairs sprouting from those worts with a couple drops of spirit gum. What was once a tired cliche is now a creepy classic! With this set, you'll receive both the spirit gum and a bottle of gum remover to make clean up easier than ever. All you need to do to attach fake hair, a prosthetic, or latex accessory to your skin is apply the gum with an application sponge or finger, wait twenty seconds until the gum is tacky, then press the hair or latex to the gum. Use a cotton swab to apply the remover when you want to clean up and you're back to your old self. Maybe you're ready to go all out for a zombie pub crawl with scars and disturbing detail. Or perhaps you want to add a little extra sparkle to your mermaid look. You could even simply be going all out for Christmas with a Santa beard. No matter what your needs are, this gum will be the bond between you and the next level of costume glory! 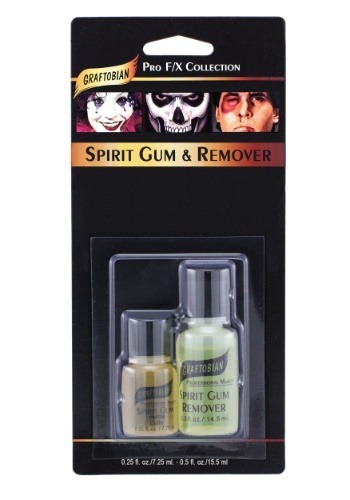 So get in the spirit with Spirit Gum!